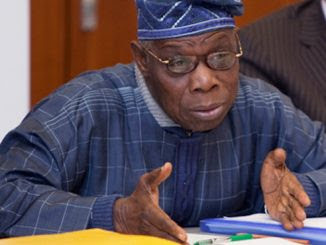 Former President Olusegun Obasanjo has decried the failure of President Muhammadu Buhari to sign the Africa Continental Free Trade Area agreement, expressing hope that he will change his mind before it is too late. Obasanjo poured out his mind during a presidential panel, titled: ‘When Leaders Make History’ at the Africa CEO Forum in Abidjan, Cote d’Ivoire on Tuesday. He was joined by the President of Zimbabwe, Emerson Mnangagwa. The AfCFTA treaty is one of the flagship projects of the African Union Agenda 2063, and is aimed at creating a single continental market for goods and services, with free movement of business persons, investments and a single currency. Also, the agreement commits countries to removing tariffs on 90 per cent of goods and to liberalise services, while items identified as sensitive, which make up the balance 10 per cent, will also be phased out later as tariff-free. But the President, Manufacturers Association of Nigeria, Dr. Frank Jacobs, said the government’s enforcement mechanism in the area of enforcement of rules of origin needed to be clearly defined before local producers could support the agreement. It is believed that the AfCFTA treaty would improve intra-African trade and enhance economic growth and sustainable development. The Federal Government had delayed the signing of the treaty to allow for more deliberations and input from stakeholders and had set up a committee on the issue before the President would sign the treaty. Speaking on the need for increased youth and women participation in politics in Africa, Obasanjo, who zeroed in on Nigeria, stated, “In our own part of the world, we have not done enough in this regard. Since independence, we have never had any woman as president and VP; no woman has contested governorship election and won. He said it was disheartening that the number of the women in the National Assembly was still very insignificant.